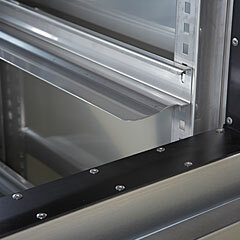 Sides, door, rails, and top-mount are constructed of heavy gauge stainless steel. Exterior back and bottom are constructed of heavy gauge galvanized or optional stainless steel. Exterior digital thermometer. Cabinet is supported on heavy-duty, adjustable 6" legs or swivel casters. Cabinet body is 100% fiberglass insulation for superior energy efficiency, minimal heat conductivity, increased fire safety and longer life compared to polyurethane foam insulation. All heavy gauge stainless steel construction with radius corners. Separate compartments on two and three section models allow multiple holding temperatures and storage of different types of food without intermingling of aromas. Heavy-duty stainless steel shelf standards and shelf clips for superior durability and corrosion resistance. Four (4) chrome plated wire shelves per section. Door openings protected by non-conductive, heat-resistant phenolic thermal breaker strip. All welded, stainless steel construction. Integral full-length UnigripTM recessed door handle with heavy-duty, built-in security lock. In order to prevent damage to door during installation, doors are equipped with self-closing lift-off cam hinges for easy door removal. Doors stay open at 120 degrees for easy access to interior. Insulation is fiberglass. See standard features on front side of sheet for standard hinging. Separate and independent heating systems and controls for each compartment save energy by applying heat only where needed. 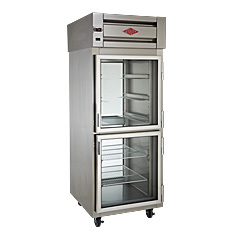 Blowerless convection heating system allows heat to radiate softly and evenly throughout cabinet. Two recessed, fully shielded stainless steel strip heating elements per section with heavy-duty stainless steel impact guards. Easy to set digital control. 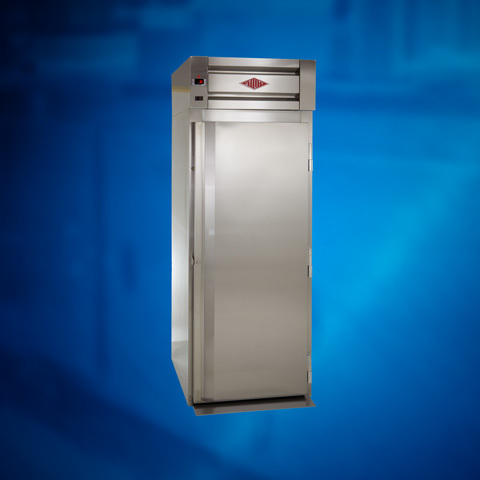 Cabinet designed to maintain holding temperatures between 120 and 180 degrees Fahrenheit. High temperature limit switch with manual reset prevents cabinet temperature from exceeding safe limit. Humidity controlling vent in ceiling of each compartment.115 or 208/230 volt units available- please specify voltage when ordering (see table above for standard voltage).